Hospital Outreach: Taking the Library to Medical Providers, Patients, and Their Families. In Rio Rancho, the local medical centers are treated to visits from a couple of experienced and knowledgeable librarians on a regular basis. 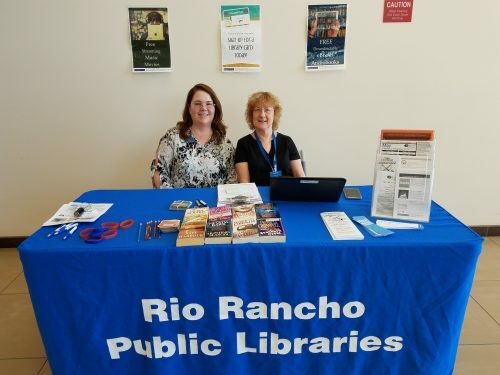 Dawn Hite and Kathy Campbell showcase the resources of the Rio Rancho Public Library to the staff and visitors at the two Rio Rancho hospitals. In May 2017 Dawn and Kathy began doing outreach at the Presbyterian Rust Medical Center cafeteria. They go every second Tuesday from 11:30-1:00, during the cafeteria’s busiest time. Their major goal is to let the public know about the resources and services the library has to offer, in particular the eProducts that people can utilize from home. Over the months, they have polished their efforts into a finely tuned process. Within their portable trolley they carry their RRPL tablecloth, a laptop to issue library cards, library program calendars for adults and children, paperback books to give away, and SWAG such as water bottles, pens, and bookmarks. They keep their outreach supplies stocked and can be ready to go at the drop of a hat. Once at the site they can set up their table within minutes. Dawn and Kathy regularly hear such positive comments as, “I have a library card with you guys and I use it all the time,” “I love the programs at the library,” and “You guys do such a good job.” Occasionally they also get suggestions as to how the library could be improved, and those comments are valuable too. Recently on an outreach to Rust, a Farmington resident stopped by for a chat and to pick up a free paperback. She shared that her mother had been brought in by helicopter and she didn’t know how long she might be there. In the course of the conversation Dawn was able to sign her up for a Rio Rancho library card and show her how to download books using OverDrive’s Libby. She was very grateful that she would now be able to download and read books while her mother was in the hospital.